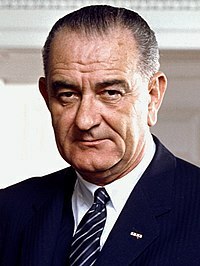 English: Lyndon Baines Johnson (1908–1973) was the 37th Vice President of the United States and 36th President of the United States. Deutsch: Lyndon Baines Johnson (1908–1973) war von 1963 bis 1969 der 36. Präsident der Vereinigten Staaten. Slovenščina: Lyndon Baines Johnson (1908–1973) je bil ameriški politik in predsednik. Pages in category "Lyndon B. Johnson"
Media in category "Lyndon B. Johnson"
The following 53 files are in this category, out of 53 total. This page was last edited on 29 May 2018, at 21:26.